I was just old enough to vote in Margaret Thatcher’s first election victory; that wasn’t a great start to my political life. It’s something in my upbringing – I think if I were to try to vote Tory my own hand would rebel against me, like Wormtail’s in Harry Potter & the Deathly Hallows (I like to keep my literary references high brow). But I’m beginning to see why other people think differently, and it’s not just advancing years. 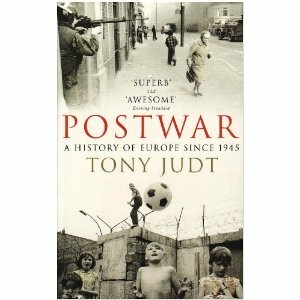 Part of it is because I’ve just got round to reading Tony Judt’s Postwar – what an amazing book. I feel like I’m beginning to understand my own history for the first time, and realise what motivates people towards such different political positions. Like all really powerful books, he doesn’t just recount facts, he tells a story, a really convincing story about the way in which different currents wove together after WW II to make Europe into whatever it is now. Once upon a time I knew everything there was to know about the military history of WW II – and then I switched off. Even now history syllabuses have a weird fascination with Hitler: my children seemed to go over the Third Reich every year. But it’s what happened after that cataclysm, when much of Europe really was laid bare, that formed where we are now, for good and for ill. The characters in Judt’s account aren’t individuals, nor really nations, but currents of thought, political possibilities. The triumph, and then the slow death of belief in the state as the arbiter for society; the renascence of neo-liberalism as soon as the generation that had seen the Great Depression started to get past retirement age; the agonising transformation of left-wing parties as the communist ideal was revealed to be a cruel parody of its own rhetoric. It’s better than a novel!